Having a radio going while you work is like being inside a time warp. There is something about the music that makes the time just a little bit faster. But hauling a big radio onto the jobsite is the last thing on my mind when I have to unload a miter saw, air compressor and my other tools. Size is the reason I have not purchased a jobsite radio, but the latest radio from Makita UK is small enough to possibly be my first. 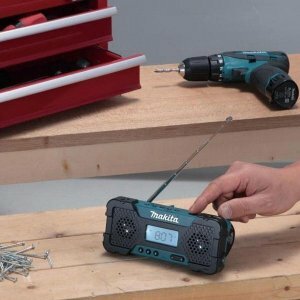 The introduction of the smaller 10.8-volt batteries brought us a few smaller radios from the tool manufactures over the last few years, but the Makita MR051 is the smallest yet. Cute is a word I rarely use, but what else would you call something so small? The radio is powered by a single 10.8V battery, and packs in two 1.5W speakers. It features an AM/FM digital tuner, AUX input, and a built in hanging hook. The sad part is the rather short 2-hour continuous run time that will have you changing batteries all day. Still it is pretty cool, though I would rather have a radio this small that runs off an 18v battery. The MR051 is not available in the US yet, but if you can't wait, you can order one from ToolStop for $46 + S/H and have them ship it across the pond.